Finally got the pictures to come up, Did not realize its literal text while editing the post, and picture does not appear until posted. This is the daughter board that emulates the two blue thru hole caps. I think it originally had 4 caps on the board, with spare pads for other unpopulated caps. two of the four caps vaporized along with their tracks and pads. You can see the four square pads at the bottom that attach to pins that go into the Main PCB where C121 and C122 were originally. I left the pins in the main PCB, because so far I have been unable to completely desolder all the pins on the two white strips to be able to remove the power devices and heat sink. I having a really hard time getting all the solder removed from the holes along the white strips to be able to remove the power devices/heatsink. The solder sucker wasn't working, and I've done multiple sessions going over the pads with solder wick. There are still lots of pins still with small amount of solder, which means I can't leaver or pry without possibly damaging some tracks. I've used up a km of solder wick and will need to do some more shopping before I can do anymore work. Originally I used an ohm meter across pairs of these pins and found quite a few with zero ohms so I thought I was seeing some shorted power devices. Upon closer look, There are quite a few of these pairs that have tracks between the pair of pads, so this was not a sign of a shorted component, I was just seeing the track between the pads. This is a side view of PCB and heatsink. To the left is electrolytic caps in doghouse, to the right, you can see some blurry gold pins/legs between the pcb and the heatsink. Those are the ones I am trying to remove solder from on the white strips on the PCB. Last edited by skylogger on Sun Jul 15, 2018 5:06 pm, edited 1 time in total. What do you see on the back side? The heat shrink has exposed quite a bit of the sides and tops of those big electrolytic caps. Last edited by kiev on Mon Jul 16, 2018 2:32 am, edited 2 times in total. 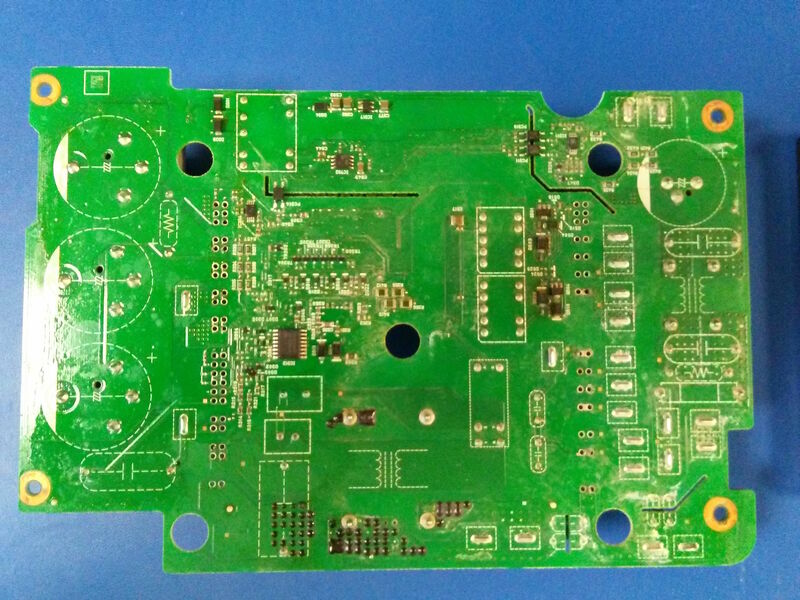 skylogger wrote: You can see the four square pads at the bottom that attach to pins that go into the Main PCB where C121 and C122 were originally. 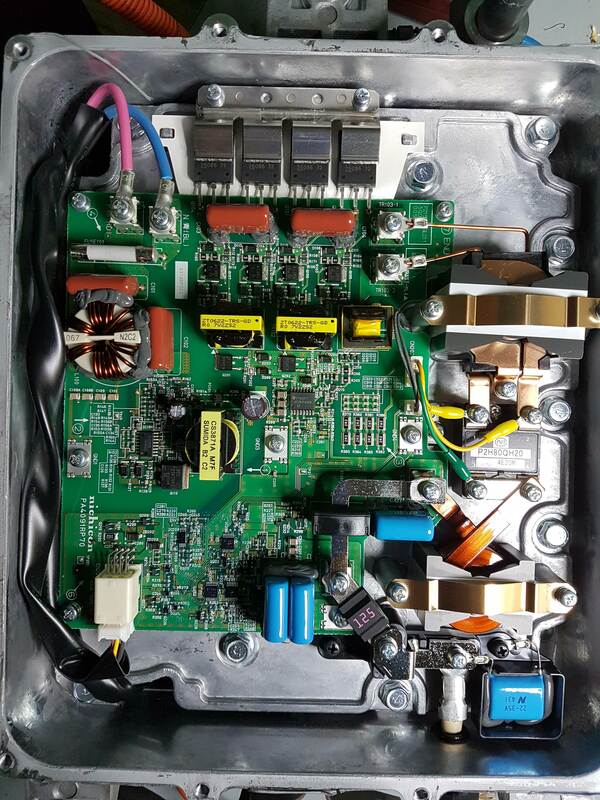 It looks to me that they are using 2S2P of surface mount capacitors to replace one through-hole capacitor. Unless they had severe supply issues, I can only see this as temporary madness on the part of the manufacturer. 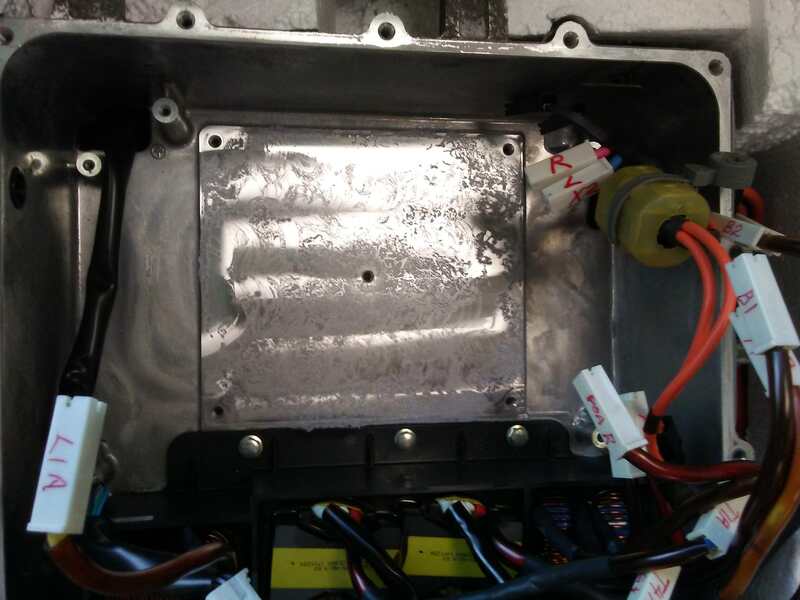 The capacitors will have different leakages and capacities, so they won't share the voltage equally. Also, these SMD components won't be able to take any sort of overload gracefully, as we can see here. What worries me is that we think that these capacitors are Y capacitors, i.e. one side is connected to chassis / mains ground. [ Edit: this was a guess which has proven false. The two capacitors, or two strings of 2S SMD capacitors, are across the charrger output.] So there must be some large transients on the mains that is over-voltaging them and burning them out. 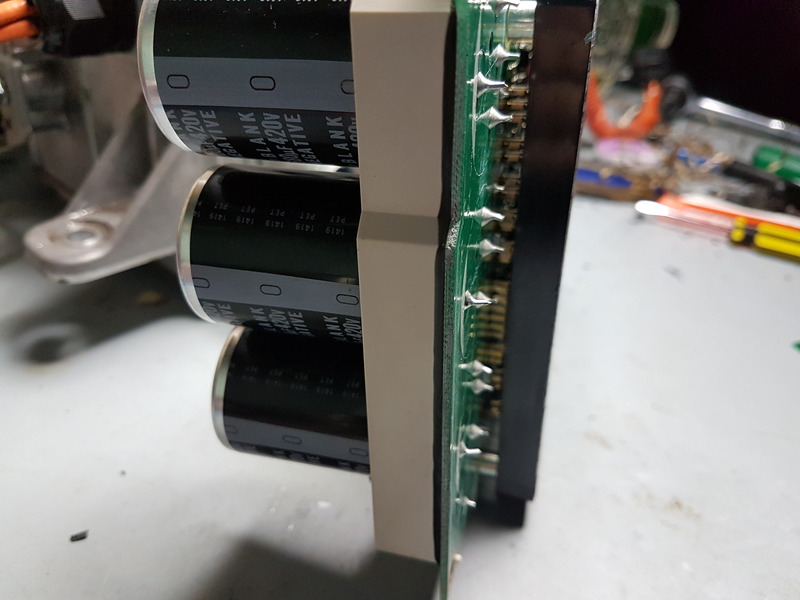 I would have hoped that other components would have protected these capacitors, for example the MOVs in the smaller mains conditioning box on top of the chargers. But perhaps we're wrong about where these capacitors are connected, as there seems to be a correlation with the pre-charge resistor burning up. The chances of a mains transient in the second or so of pre-charge would be very small compared to the hours of charging, when the pre-charge resistors should be shorted by the mains relay. Hopefully, we'll find out soon. Last edited by coulomb on Mon Sep 03, 2018 11:52 pm, edited 2 times in total. I've opened up the under side of the box where the DC-DC Converter is located. This picture is the result. does not blow the fuse, then I may get 12v battery charging working again. I tried desoldering the 100x leads from the main charger PCB to the heatsink, but could not get all the solder out of the vias. I tried multiple sessions, but could not get every lead to wiggle as free, so didn't want to try prying and risk damaging any tracks. plug and connected up the 12v battery. Connected up the MUT III Analyser, and had two errors being reported concerning OBC and DC-DC. could see the charge light on dash blink, then the HV Fault came on the dash, then both went out. It appears that even though the AC Charger still is not working, The MUT III Analyser was not reporting any errors. Just as a test, I tried to use the MUT III to ceck the hardware and software revision levels on the charger, and received a communications error. 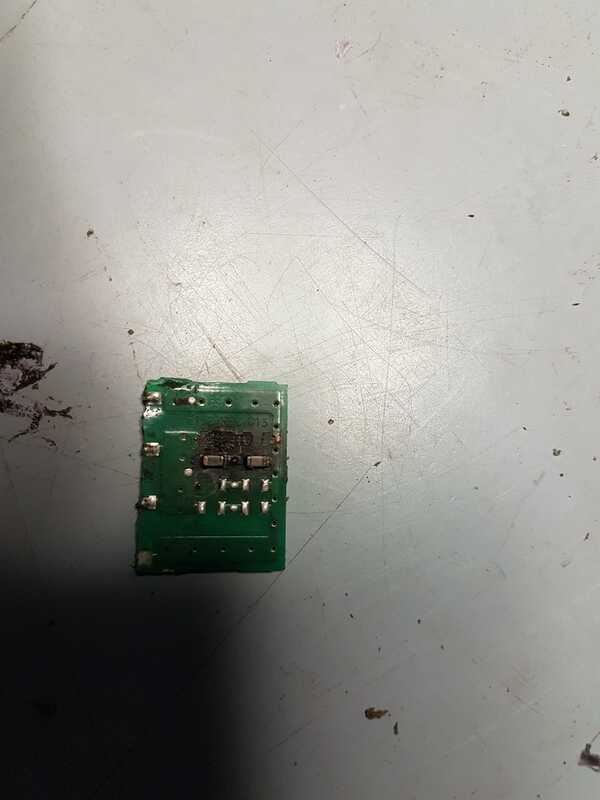 This leads me to believe that the PCB with the processor witin the charger is not working well enough to establish communications with other devices on the canbus. checked the canbus connectors but was still unable to resolve. As a test, we drove the car to a location that had a Chademo quick charger, and we are able to use the Chademo port to charge the car. 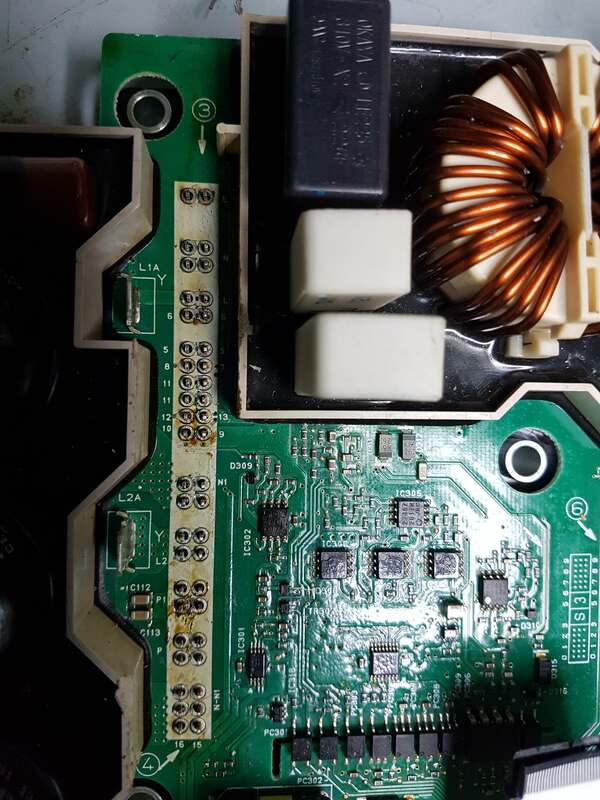 So this now leaves options to try and repair the controller PCB in the charger, get a replacement charger PCB, Get a replacement whole charger/dc-dc, or buy a portable chademo external charger. Hopefully KIEV is sucessfull in doing something with the charger he is soon to receive, and this may give me a clue on how to proceed. skylogger, thank you very much for sharing the details. Hoping for a technical troubleshooting breakthrough by our 'team'. i haven't traced the circuits yet, just opened the top of jray's box to remove the boards. This is a view of the plate that attaches to the heat sink. 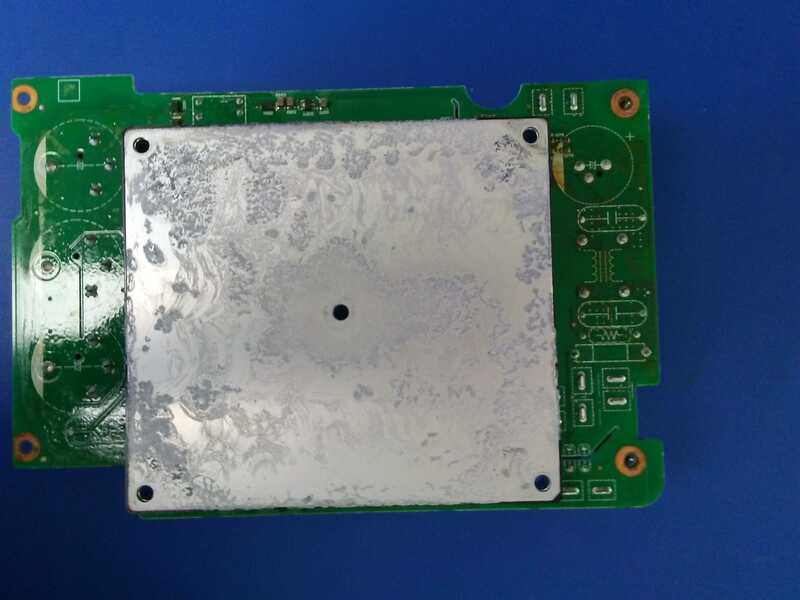 It is covered with a thermal paste that is non-conductive electrically and is really too thickly battered in places--excess compound defeats the purpose. And here is the subject view without the plate after de-soldering 72 joints. This shows what was hidden above the plate--and it's still hidden, buried under hard epoxy-type potting compound. Not easy to remove. Last edited by kiev on Fri Jul 20, 2018 2:39 am, edited 2 times in total. Seems to be quite small and limited for such a big and heavy box with liquid cooling. Here is the heatsink area in the top plenum covered in thermal paste. i'm going to clean and check the flatness. Jay's charger box has this nichicon part number on the bottom board, so we can use this as a reference designation as needed. The only doghouse items not shown are the two high voltage (2kV, 1000pF) capacitors (C121 and C122, the blue M&Ms in jay's box and the SMD caps on a vertical board in skylogger's box), which are not part of the AC input at all. They are connected in parallel and appear to be snubbers on an inductor connected to a DC power buss, P0A. 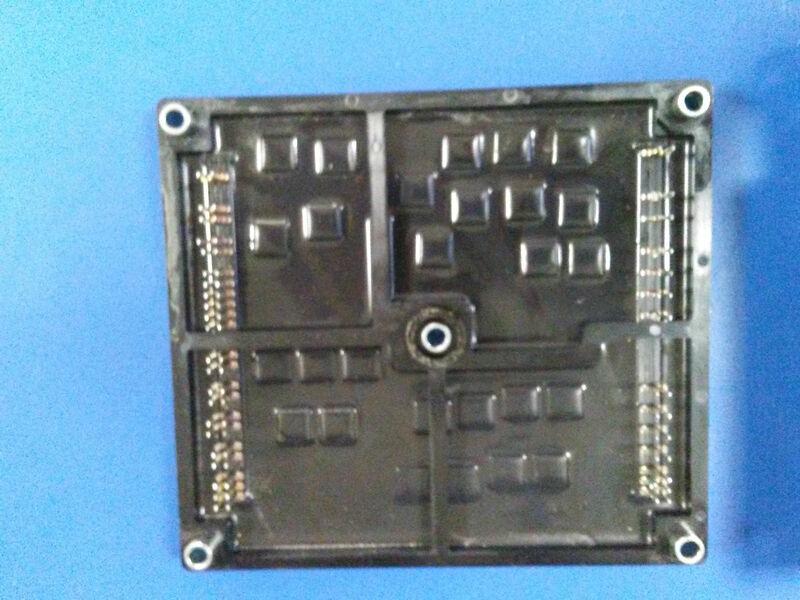 Using the daughter board with SMD caps is actually a smarter move than the thru-hole blue caps--it allows repairs without removing the big bottom board and de-soldering all the joints to get to the bottom side. And they even left a spare set of contact pads that can be used for the repair. There seems to be 4 DC power busses on this board designated as: P, P0A, P1, P2. Last edited by kiev on Thu Sep 13, 2018 4:18 am, edited 1 time in total. 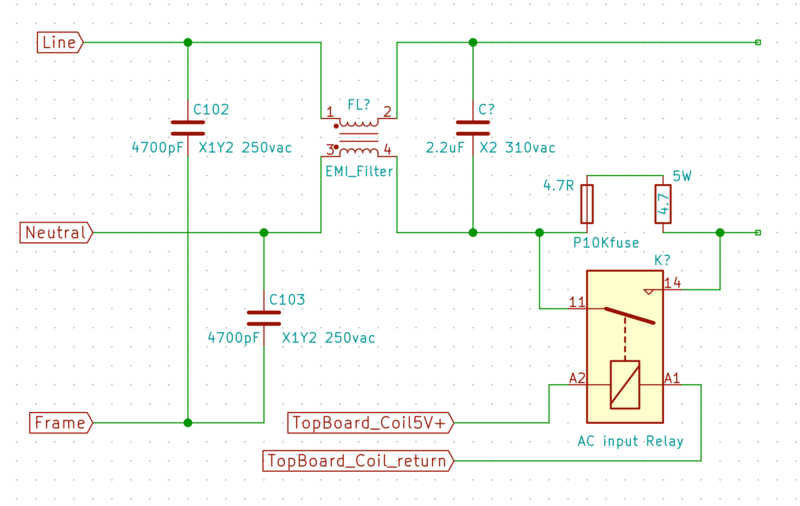 On your schematic of the Doghouse, you show the output of the drawing which will either be from the closed relay, or from the bypass resistors. If the pcb is still fitted in the box and heatsink still intact, so you cannot probe the bottom of the board, is there any points on top of the board where you can probe these output points while power is on, so it can be determined if resistors are ok, or relay contacts are ok? There are two wires (a white and black) with quick connects that run from the top board down to the bottom board next to the dog house. Are these related to this part of the circuit?